Brokis's Capsula light collection is made of hand-blown glass and wooden buttons. Resembling beads on a string, each glass pod contains dimmable LED rods, and is available in yellow, violet, gray, and amber. Designed by Christophe Mathieu, Bover's Slend LED lights come in three shapes and colors: polished aluminum, glossy white, and black. 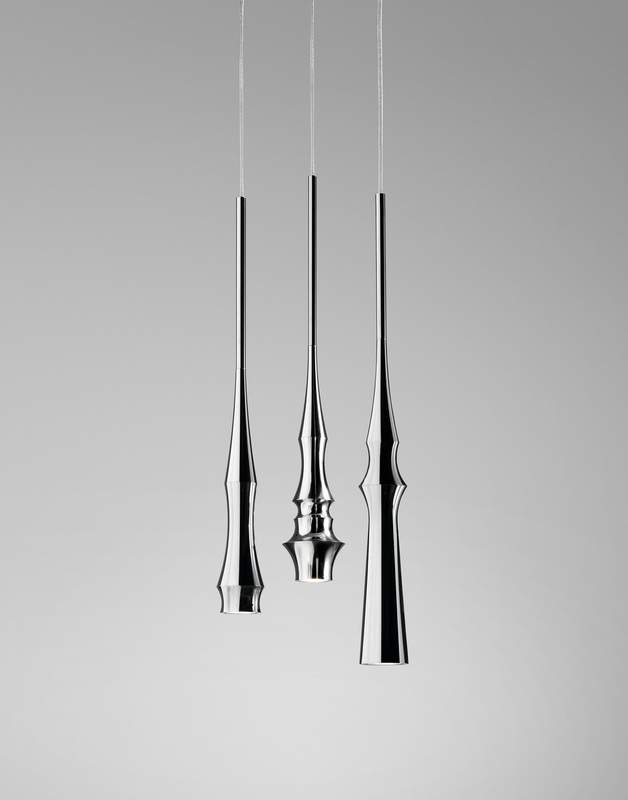 Each is available with a 78-inch cable for hanging, and carries dimming capability. The Kopra lamp, designed by David Weeks Studio, is finished with powder-coated steel. Available in high-gloss black (pictured) or white, its clustered bouquet of lights makes for a dramatic statement. Made of perforated sheet metal, the Hexx lamp by Diesel Living with Foscarini radiates an optical mioré effect when illuminated. Its materiality and hexagonal shape are a nod to industrial elements. A string of opaque geometric fixtures with peeks of satin copper interiors comprises Gabriel Scott's Welles light system. Newly available in matte white, it can be customized to varying configurations and lengths. Part of the High Fidelity collection, the shade of LZF's Escape lantern is made of thin, rectangular sheets of Timberlite wood veneer, arranged to resemble a carefully shuffled deck of cards. A prototype by Niels Datema, a recent grad of Design Academy Eindhoven, Graphlights makes use of graphite's conductive properties. 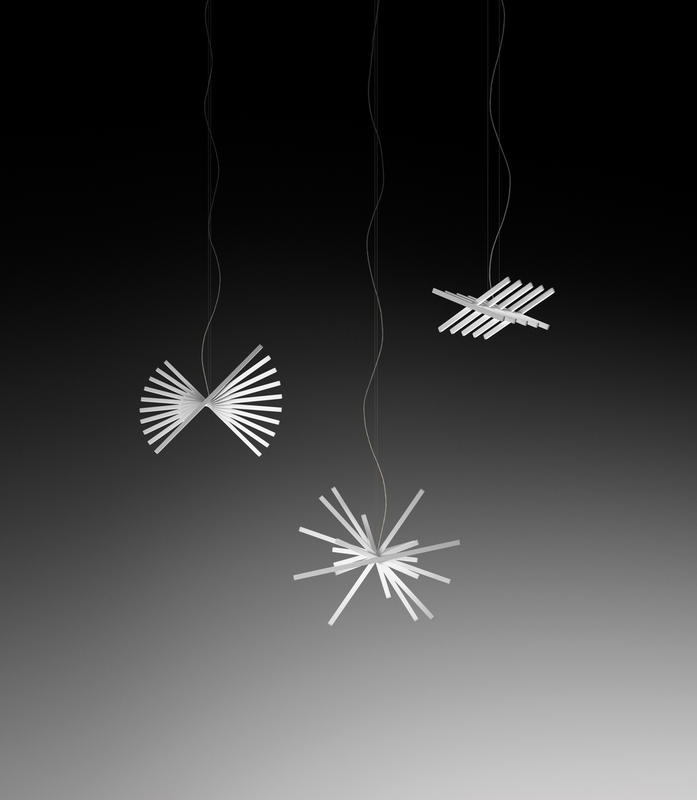 Molded separately, the base and shade illuminate when linked, and can swivel freely. Available in pink rose, black gloss, and smoked bronze, the bevelled mirror glass of Afroditi Krassa's Pentagon pendants are a subtle reference to the graphic opulence of Art Deco. The ambient glow of Lee Broom's Globe light, made with carrara marble and lead crystal, makes for a pleasing centerpiece. Part of Broom's Nouveau Rebel Collection, it measures nearly a foot and a half tall. Designed by Saint-Louis by Florence Bourel - who cites a Breton lighthouse and an ice bucket among her inspirations - the Plein Phare table lamp is made of crystal and chrome, and can be dimmed by switch. With its spare, minimal pairing of a concrete block and aluminum LED rod, Umbra Shift's Brick task lamp recalls the clean, severe lines and weighty materiality of Brutalist architecture. Designed by Sputnik Studio, Marset's outdoor Santorini light derives its shape from common fishing-boat lanterns. Blown, pressed glass diffusers allow for easy manipulation of light-intensity and direction. Neatly lined rows or spherical, transparent LED bulbs give Moooi's Prop light a theatrical feel. The collection carries 10 other variations, including freestanding, wall-mounted, and suspended options. The Luck pendant by Estiluz is made of steel and a diagonally cut mouth-blown glass ball shade that can be adjusted to cast direct or indirect light. Variations include custom finishes and a range of colored glasses. The IC light collection, designed by Michael Anastassiades for Flos, explores the principle of balance through a juxtaposition of two basic forms. Lit by a frosted halogen bulb, the fixture is made of brassed steel and blown glass. Bec Brittain's Echo 2 pairs brass rods with white opal glass panels to render its LED lights in a soft, otherworldly glow. The lamp comes in a range of metal finishes and glass colors, including clear mirror. Designed by Matter proprietor Jamie Gray for the boutique's in-house Matter Made line, the stately Discus pendant borrows its name from the Olympic pasttime. Each of the nine discs houses a dimmable LED light. Referencing tube amplifiers from the 1960's, the Amp table lamp by Normann Copenhagen evokes a warm vintage feel. Made with gold glass and green marble, it can easily be hung as a pendant. Evoking the electron orbits of an atom, the ribbons of Estiluz's Siso, by Estud Ribaudi, are crafted from plated or painted aluminum and seem to float around the spherical diffuser. the wall sconce, table lamp, and floor lamp versions come in chrome and white. Artemide's Alcatraz lamp juxtaposes the simplicity of its stand with the kinetic curve of its thermoplastic diffuser. Designed by Giuseppe Maurizio Scutellà, the LED lamp array has two dimmers that allow for adjustment of direct and indirect light. Philippe Starck's Biblioteque Nationale floor lamp for Flos has built-in bookshelves, perfect for those who don't want to stray far from the couch for reading material. Made of chrome-plated die-cast zinc, the stand incorporates a USB port to recharge e-devices. Jamie Hayon's latest creation for Baccarat, the Baby Candy Light lamp features a faceted lead crystal lampshade, resulting in a visually arresting object. The ceramic base comes in black or white. 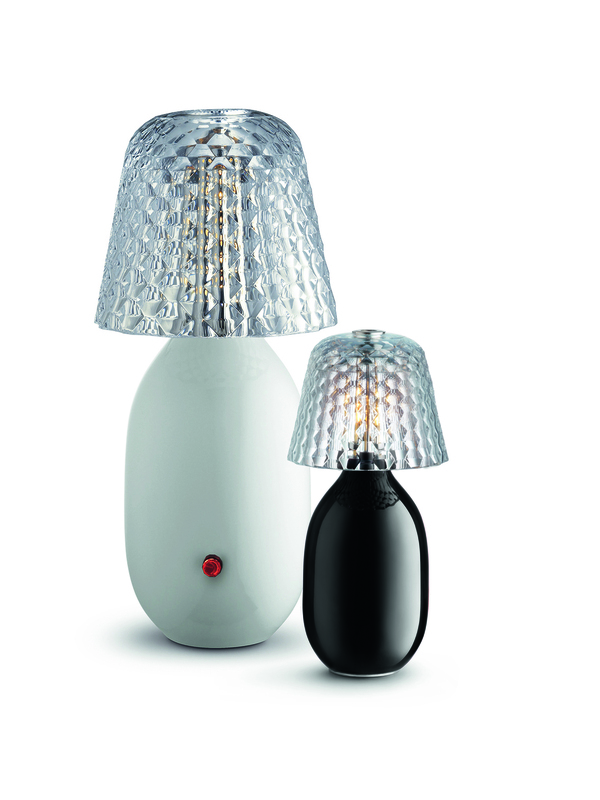 A larger version of the table lamp, also shown, was introduced in 2011. Marset's Nenúfar features an array of one, two, or three circular polycarbonate discs angled at 120 degrees from each other, providing separate showers of LED light. The set, which takes its name from water lily, can be used in multiple clusters. To design his Container By lamp for Ligne Roset, British designer Benjamin Hubert took inspiration from earthenware. 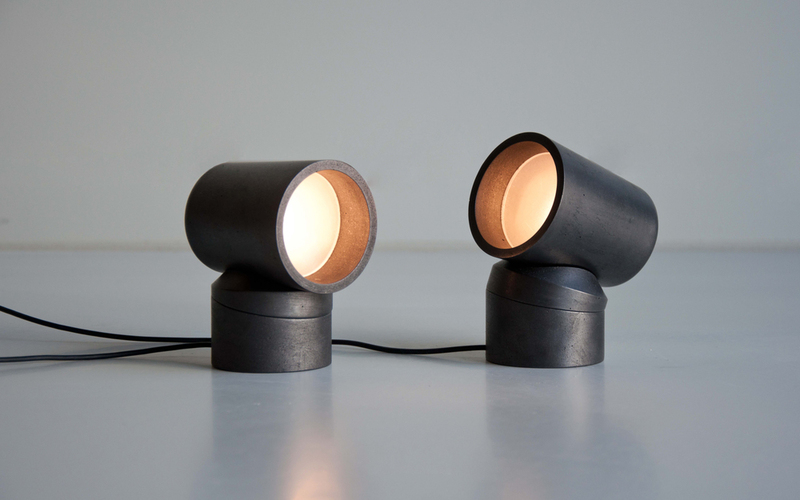 the light consists of two ceramic pieces joined together by a silicone band; a steel weight in the base stabilizes the fixture. Santa & Cole enlisted the studio Raw Color to expand the palette for its lampshades; the terracotta, mustard, and green options, each blending together three separate yarns, can be used for any of the brand's ribbon-shade lamps. Aiming at a younger consumer, the fashion brand Diesel takes its attitude from jeans to interiors with Foscarini's Soft Power lamp. Details are drawn from the denim world: The shade and base are made of printed cotton fabric and feature a double-stitched seam. Sonneman's Level light contrasts opacity and transparency while celebrating minimalism: The lanternlike glass base reveals the electric cord, which is covered with red silk. The light's paper lampshade comes in black or white. Canadian designer Matthew Cleland, who designs terrariums through his company Score + Solder, recently introduced a new series of handcrafted glass lamps. The debut of the line includes two crystallike shapes, each with three color options. The Monocle bedside sconce, designed by Brooklyn-based Rich Brilliant Willing, references nautical lights. Its machined aluminum casing, in black or champagne, can be swiveled to provide direct or indirect light from the dimmable LED. Clustered, hanging, and free-standing, these new fixtures transform spaces in dramatic ways.